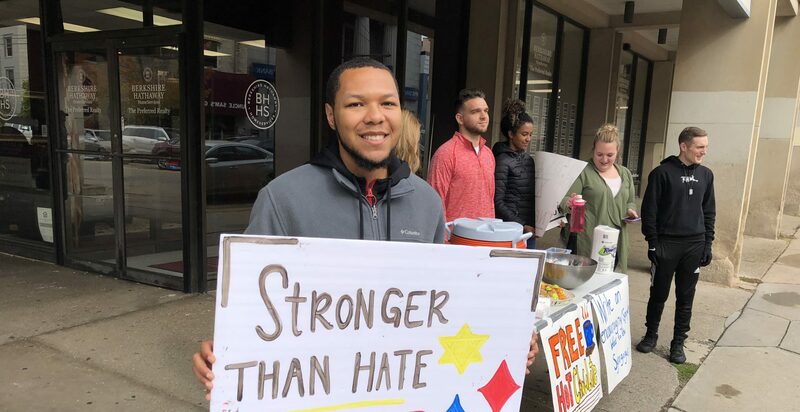 Dean Garland Jr., who grew up in Pittsburgh, holds a “Stronger Than Hate” sign on Nov. 1 in Squirrel Hill. Days earlier, a man shot and killed 11 people at the nearby Tree of Life synagogue. Six people were wounded. In Pittsburgh, ‘a lot of pain, and a lot of beauty.’ How will it change the city? Saralyn Tabachnick, who grew up in Squirrel Hill and now lives in Alaska, writes a message of support on Nov. 1. A man shot and killed 11 people on Oct. 27 in the nearby Tree of Life synagogue. When Saralyn Tabachnick thinks of the place she grew up, she thinks about her synagogue, the parks and the Jewish Community Center — which was smaller back then. There are the tree-lined streets, the families out together, and a place full of life, and heart, and activity. She moved away and, for 31 years, has lived in faraway Juneau, Alaska. She works as an advocate for victims of domestic violence and sexual assault. She loves Juneau — even ran for mayor of the city. Tabachnick, 61, was back in her old neighborhood last week for a family visit, one that happened to coincide with the aftermath of a tragedy: On Oct. 27, a gunman killed 11 people inside a Squirrel Hill synagogue. 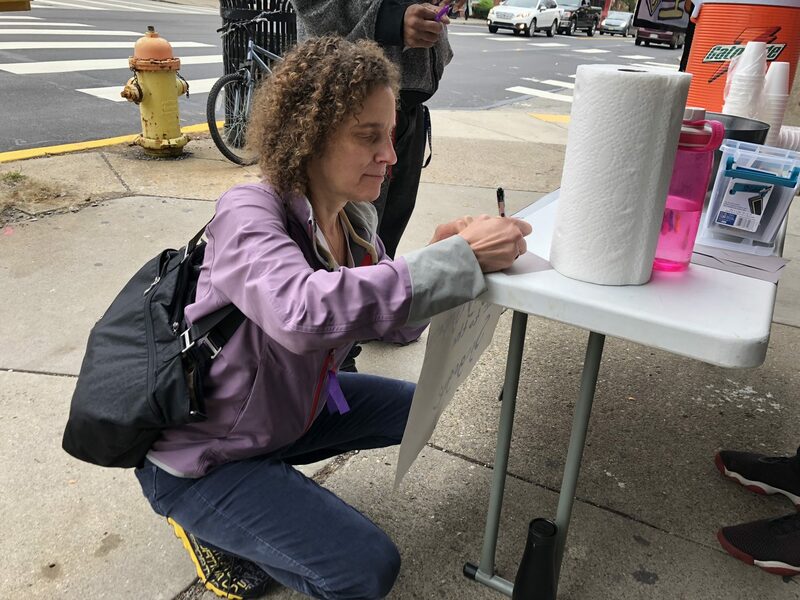 Last week, she stopped on a street on a corner where a group of mostly 20-somethings were offering what comfort that they could: free hot chocolate, snacks, pens and paper to write messages of support. Pittsburgh became one more city to grab the world’s attention after a horrific mass shooting. Afterward, Christians, Muslims and others rallied to the support of the Jewish community. #PittsburghStrong joined #ParklandStrong, #VegasStrong, #CharlestonStrong and others. People throughout the city say they have seen greater unity, and they hope to build off it. That’s the beauty. But there’s pain — the people lost, the difficult questions of what to tell children, the fear that it might happen again. And there’s fact that the idyllic-looking Squirrel Hill — the real-life home of Mr. Rogers — is now home to the deadliest attack on American Jews in United States history. The unity on display in so many parts of Pittsburgh is common in the immediate aftermath of a disaster, said Elana Newman, co-director of the University of Tulsa Institute of Trauma, Adversity and Injustice. But often that is followed by pulling apart, and sometimes a disaster exposes existing tensions. “And then there’s the question of what happens next,” Newman said. So what may happen in Pittsburgh? Here’s a portrait of how Pittsburgh is wrestling with the grief and changes, from a black woman who lost two sons in the 1990s to gun violence and felt like the Jewish community was her family, to a Colombian immigrant who’s worried that refugees will feel unwelcome, to a rabbi who sees a connection between the trauma that Pittsburgh experienced and the heat that strengthens steel. 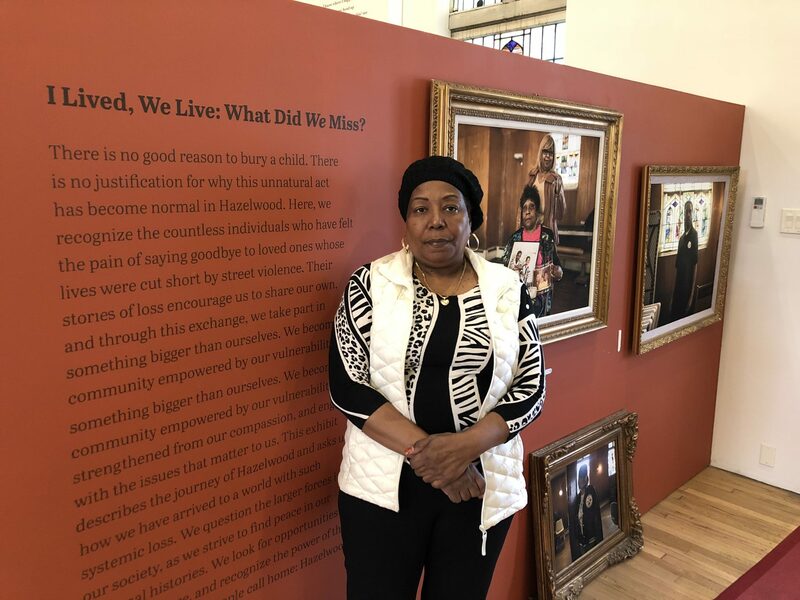 Geraldine Massey stands in front of the “I Lived, We Live: What Did We Miss?” gun-violence exhibit at the Center of Life in the Hazelwood neighborhood of Pittsburgh. A version of the exhibit will be shown at the Jewish Community Center of Greater Pittsburgh. Several weeks ago, for the Jewish holiday of Yom Kippur, the JCC of Greater Pittsburgh invited Geraldine Massey to speak. Massey lost two sons to gun violence in 1993, less than two months apart, in Pittsburgh. After those deaths, she relied on a lesson her grandmother had taught her, and looked for things to be grateful for. And she became grateful for the three children she still had living. She now works as a family counselor and outreach specialist for Center of Life. The organization is aimed at revitalizing Hazelwood, a neighborhood that struggled and lost businesses after the collapse of the steel industry. It’s about a 10-minute drive from Squirrel Hill. Massey was humbled by the JCC’s invitation, and that her sons mattered to the people there. 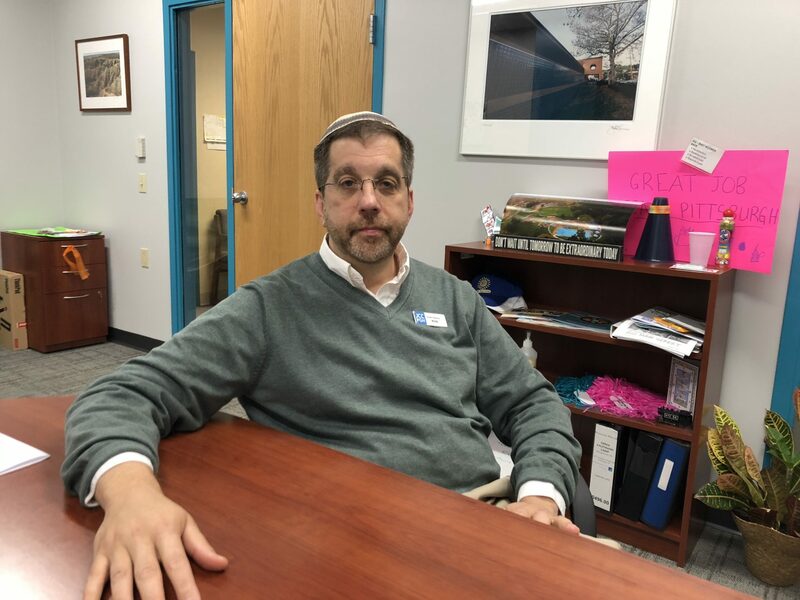 Rabbi Ron Symons, senior director of Jewish Life for the JCC of Greater Pittsburgh, said the idea was to bridge divides between neighborhoods. He thinks gun violence in the black community is too often swept aside. He saw Massey’s resilience as heroic and thought it could inspire anyone to be a better person. Rabbi Ron Symons, senior director of Jewish Life at the Jewish Community Center of Greater Pittsburgh, is seen in this photo on Nov. 1. Now, he said what she taught congregation members weeks ago is part of their lived reality. For Massey, the shootings at the synagogue felt like a wound being ripped open. “My heart still aches … because they’re family to me, because they welcomed me. They embraced me and took me in,” Massey said. Both Symons and Massey talked about building off the solidarity in the wake of the synagogue shooting to build stronger connections. Before the Oct. 27 shootings, the JCC was already planning to bring into its doors a version of a gun violence exhibit — “I Lived, We Live: What Did We Miss?” — that Massey worked on at the Center of Life. That is still the plan. 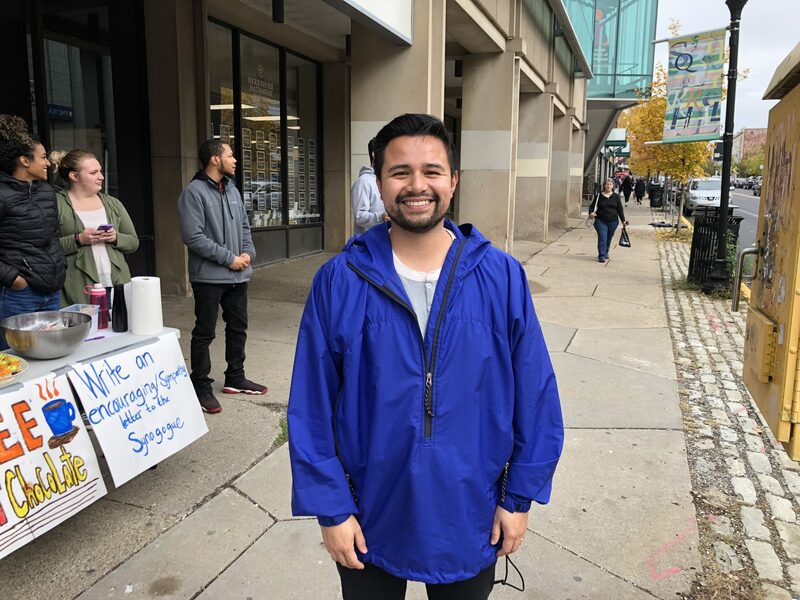 Diego Colmenares grew up in Colombia and moved to Pittsburgh about 10 years ago. He and others with Youth With A Mission offered free hot chocolate and snacks to people in Squirrel Hill on Nov. 1. Diego Colmenares grew up in Colombia and moved to Pittsburgh about 10 years ago. The city and its people always felt welcoming. Colmenares now works for Youth With A Mission, an evangelical missionary organization. The alleged shooter at the synagogue had a social media history of expressing hatred toward Jewish people and the refugees they supported. Among other things, Colmenares worried about the message that the shootings sent to refugees and other migrants. “A lot of people have reassured to us — and especially to, you know, people like me — like, ‘Hey, we stand for the truth, we stand for diversity, we stand for including all kinds of people,’ ” Colmenares said. Many people passing by thanked them. Some wanted to know about more about the group. Dean Garland Jr., an 18-year-old student in the discipleship program of Youth With A Mission, grew up in Pittsburgh. Tabachnick, the former Squirrel Hill resident who now lives in Juneau, was one of the people who stopped at the table. She thought it was beautiful that they were trying to help the community. “I think that’s what life’s all about,” she said. Pittsburgh, too — at least for her. He is the senior rabbi at Rodef Shalom Congregation, which hosted some of the funerals for the synagogue victims. On Friday, he was one of the leaders of Shabbat services. Jean Cox, 60, showed up to that congregation with her Presbyterian pastor, Jeff Eddings, and her husband, Tom Cox, as a show of solidarity. 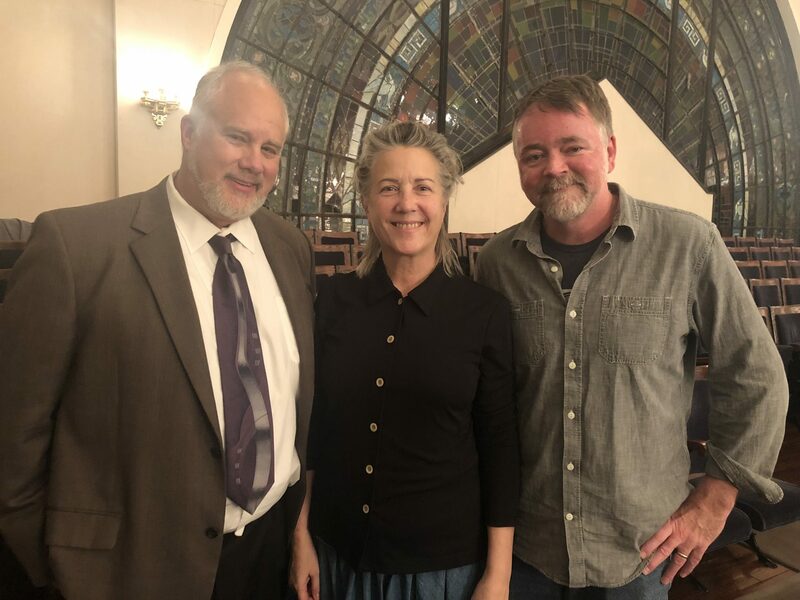 From left to right, Tom Cox, Jean Cox, and Pastor Jeff Eddings, are seen inside Rodef Shalom Congregation in Pittsburgh. They attended services Nov. 2 to show solidarity with the Jewish community. “It was extremely important for us to actually share our physical presence with them,” said Jean Cox. Cox and her husband moved to the Pittsburgh area about 13 years years ago, after living in suburban Chicago. For Tom Cox, 56, the Pittsburgh community feels more connected. It’s not that everyone in the city knew someone who was a victim of the shooting. But, Tom Cox said, it seems like everyone knows someone who knew one of the victims. During the service, Valerie Bacharach talked about her own Jewish faith, and how she is originally from the flat land of Columbus, Ohio. She fell in love with Pittsburgh, its rivers, bridges, crazy streets that arc and bend, its vibrancy, its neighborhoods, its open arms and big heart. After the service, just a few steps away from where he had addressed the crowd, Bisno talked about Pittsburgh’s past and its future. The city was built on steel mills. Over the years, Pittsburgh and the region has transformed into a place focused on education and healthcare jobs. But steel is still here. “Steel is forged and strengthened in a kiln,” Bisno said. The same will happen, he said, with the city. 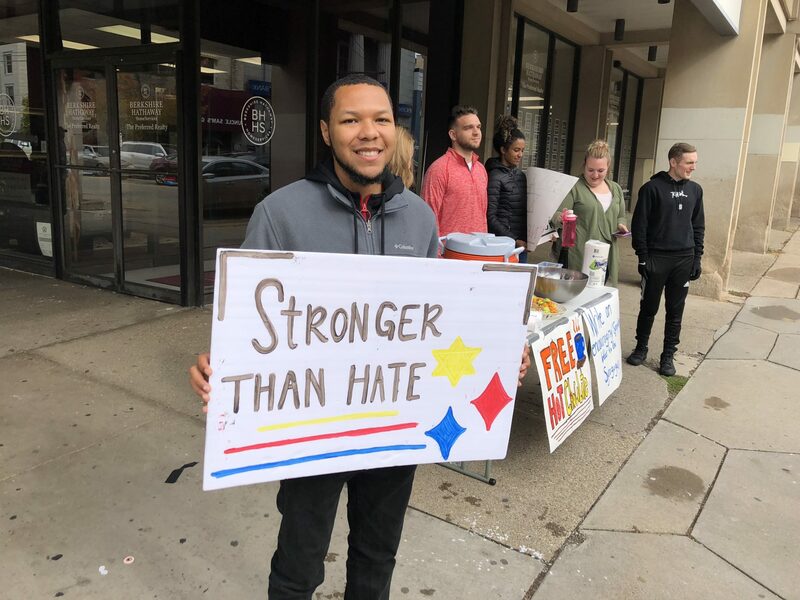 Dean Garland Jr., who grew up in Pittsburgh, holds a “Stronger Than Hate” sign on Thursday, Nov. 1, 2018, in Squirrel Hill.